Wouldn’t it be great if you could get rewarded for allowing retailers to use your data? If you think so, Nucleus Vision may have the solution for you. You may have heard of terms like “Internet of Things” or “Neural Networks”. The team at Nucleus Vision are among those attempting to bring these concepts to fruition with the use of blockchain technology. Through their token, nCash, Nucleus Vision aims to allow individuals to monetize and securely manage their data on the blockchain. The core of Nucleus Vision revolves around the emerging Internet of Things (IoT). Think about all the “smart devices” that exist these days. Everything from door locks to refrigerators can be connected to the Internet. These devices enable retailers to collect and analyze customer usage data, which in turn helps them optimize their business processes and increase profitability. This kind of data collection and analysis has been widely established online on well-known sites like Facebook and Google. It’s a huge reason why we aren’t required to pay to use their services. However, as the saying goes, “there is no such thing as a free lunch”. Big name Internet companies have become so accurate at analyzing our online activity, that advertisers have unlocked the power to influence our perceptions and opinions to the point that regulators are feeling the need to get involved. In fact, Facebook founder Mark Zuckerberg was recently under scrutiny by US lawmakers in a highly anticipated congressional hearing. Nucleus Vision hopes to use blockchain technology and multi-layered communication protocols to connect retailers and customers in a way that addresses the growing concern around data collection and user privacy. At its core, Nucleus Vision is a customer identification system that uses IoT technology. The system consists of four core features: ION sensor, Neuron layer, Orbit blockchain, and nCash utility token. Unlike many blockchain based startups, Nucleus Vision has created a physical product which is an integral part of driving adoption. ION is an IoT sensor which retailers can purchase and set up in their brick and mortar shops. The sensor has the ability to sense when a customer has entered a shop and sends their personal preferences, past purchases, etc. to the shop owner. Of course, that’s only if the customer has authorized their data to be shared with the retailer. The sensor can also collect data on the customer’s movement, temperature, sound, and other variables while in the store. Interestingly, the sensor does not require RFID, Wi-Fi, Bluetooth, or GPS technologies. Instead, it uses standardized telecom protocols for communication – the kinds used by cell phones such as 2G, 3G, and LTE. ION sensors are connected to the phones of customers via the Orbit blockchain where data and nCash tokens are securely transferred. This enables retailers to receive customer data and customers to receive nCash tokens. Retailers don’t only want raw data, they need actionable insights from the data. The Neuron Layer is an analytics engine which sorts through data and creates a personal identity for a user and assigns them a score specific to each store that they visit. This score informs retailers of how valuable the customer is to them. The Neuron Layer is also able to determine other aspects of the customer such as an optimal time for a retailer to engage with them. By using this information, retailers can craft an optimal experience for customers and thus improve their conversion rate. 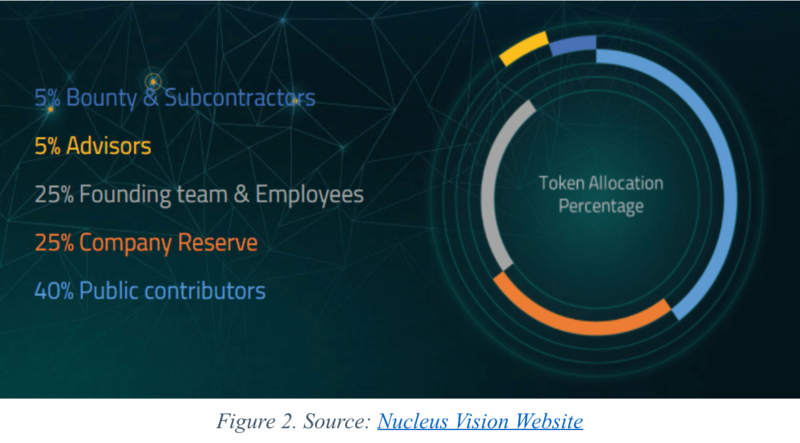 The nCash tokens are the fuel within Nucleus Vision’s system. They are ERC20 tokens that are used to incentivize customers to share their data with retailers. Customers have full control over whether or not they share their data on a store-by-store basis. However, if they opt-out, they will not receive any nCash tokens as rewards. Retailers can also create a rewards system through nCash such as a loyalty program or by gifting nCash to new customers. Customers can then use nCash to pay for goods (at accepted stores) or trade for other digital currencies on crypto exchanges. The Nucleus Vision technology stack (BASICST2S4) was designed to be multi-layered, integrating the ION sensor, Orbit blockchain, Neuron analytical layer and third-party apps as visualized in Figure 1. Brand integration stack – Connects brand with Nucleus Vision ecosystem. Uses web portal and iPad to track and view customer info. Application reward stack – Handles all nCash transactions and request-response pairs. Also enables rewards programs. Software development kit – Facilitates 3rd party apps that want to tap into loyalty programs and customer recommendations. Intelligence neural network stack – Captures relevant information and develops data models that can inform customer recommendations. Crypto network stack – Facilitates transfer of nCash tokens between retailers and customers. SIM data infra stack – Maps different data sources to a standard data schema which will make integration with Nucleus Vision simple. Telecom consent stack – Routes customer consent information from telco operators to Nucleus Vision. IoT sensor – Technology agnostic, plug and play sensor that can identify 32 unique IDs in 612 microseconds. If no previous shopping history for customer exists, retailers can request for data from extended partner ecosystem. If the network partners accept the request, the customer is prompted to authorize again. Nucleus Vision technology assigns a unique score to each customer. It signifies the customer’s value to the retailer based on many factors. The retailer can offer nCash tokens to the customer based on various situations during their visit. nCash is listed on Binance which sees the most volume of trades. It is also listed on a few other smaller exchanges such as Koinex, Bitbns, and IDEX, although these combine to be less than 2% of nCash’s total volume, according to CoinMarketCap. Nucleus Vision held a successful ICO, hitting their hard cap for funding of $40 million. ICO price was 1 nCash = 0.01 USD. Public sale of nCash accounts for 40% of the 10 billion total tokens created. The remaining tokens are allocated for team members and other uses, as described in Figure 2. Nucleus Vision was founded in 2014 at Harvard Business School by its CEO Abhishek Pitti. The team has offices in San Jose, California, and Hyderabad, India. The startup has attracted the attention of investors, including Tim Draper, a notable figure in the world of blockchain venture capital. Many other investors and team members of Nucleus Vision come from the Indian business world. They have developed partnerships with Vodafone and Reliance telecommunications, two of India’s major mobile service providers, as well as tech companies like Intel, Radisys, and others. Currently, Nucleus Vision is working on scaling retail adoption in India. At time of writing, they have 10 retail stores running ION sensors and slightly over 100,000 individual identities registered on the platform, according to the live count on their website. In Q3 and Q4 of 2018, the team plans to scale across stores in India and then Southeast Asia, eventually launching in North America by Q1 2019. Further down the road, they hope to expand security features of the platform in order to apply the Nucleus Vision technology to the cybersecurity industry. In the long term, Nucleus Vision is looking to expand beyond brick and mortar retail IoT connectivity. The company will aim to provide solutions for industries such as smart homes, advanced healthcare, and agriculture. A timeline of their expansion is seen below in Figure 3, but you can check out a more detailed roadmap on their website. In recent times, the cryptocurrency space has been fraught with a lot of controversy surrounding ICOs and the increased skepticism towards newly created coins. However, while many are indeed pump & dumps, there are still several with real-world use cases and potential to disrupt existing industries. Whether this includes Nucleus Vision or not, is up for debate. Regardless, the company does seem to be gaining the attention of the crypto world while gaining financial backing and partnerships. One of the unique aspects of the startup is that it is developing an end-to-end system with ease-of-use and mainstream adoption in mind. Nucleus Vision is an example of a blockchain project that can appeal to the traditional business world, as proven by the varying backgrounds of its investors and team members. Ultimately these kinds of collaborations could lead to greater public awareness of the crypto space as a whole. Cryptocurrencies and other internet-based technologies have been working to improve the digital world since their inception. Nucleus Vision is betting that the digital world is going to increasingly spill over to the physical world. And if that bet pays off, their project could be wildly successful. The project’s vision seems beneficial to the burgeoning blockchain industry, yet the issues of digital privacy and data manipulation have become more scrutinized in recent times. The use of blockchain is no doubt a great solution to this, but it’ll have to be accepted by the mainstream public. The public may view Nucleus Vision’s system as suspicious or untrustworthy at first. This is a drawback that comes with creating an end-to-end system for selling personal data. The other potential issue stems from potential regulation of the transfer and sale of personal information. As mentioned at the beginning of this article, Facebook’s CEO testified to US lawmakers on their recent data scandal and expressed an openness to government regulation. Similarly, Tim Cook, CEO of Apple, has also called for increased regulation to avoid personal data being misused. Brand new rules for this new industry could potentially create roadblocks for companies like Nucleus Vision, depending on the scope of such regulations. That is in addition to possible regulations facing the blockchain industry. 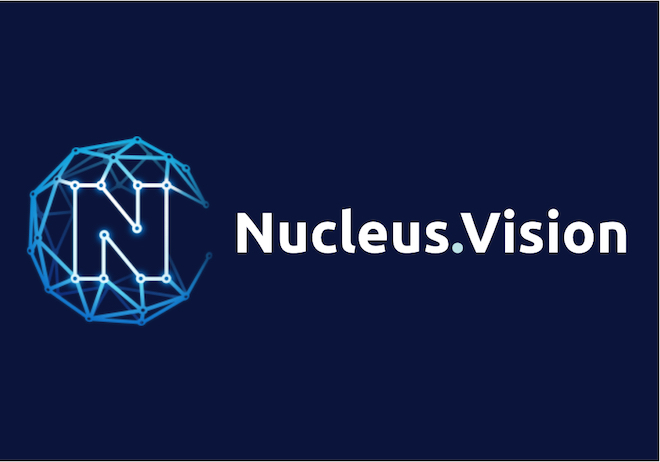 Overall, Nucleus Vision seems to have the potential to follow through on their goals considering their experienced team, their progress so far, and the partnerships which they have attained. Also Read: Hedera Hashgraph Review – The Blockchain Killer?